Well, after many, many trial runs, I’ve finally worked out a granola recipe that I’m happy with. The best thing about it is that it’s actually pretty flexible; almost every time I’ve made it I’ve used different nuts, and different ratios of honey and maple syrup. The recipe below is my favorite version, but you can change a lot of things. First of all, you can use any add-ins that you want. In this recipe I used blanched almonds because that’s pretty much all I had in the house, but you can use any kind of nut, or add in some dried berries or sunflower seeds. Whatever you want. The other optional aspect is the liquids. You want to have 1 ¼ cups liquid, excluding your egg white. You can use honey and maple syrup (the fake kind) like I did, or you can use real syrup, corn syrup, and I’ve heard you can throw some peanut butter in there too. Anyways, I managed to get some pictures in before my family ate it all this time, so here’s the recipe for my favorite granola finally. Enjoy!! -Mix the oats, almonds, brown sugar, cinnamon, nutmeg, salt, and vanilla in a large bowl. -In a liquid measuring cup, measure your honey, then add the oil to the measuring cup, then fill with syrup to make 1 ¼ cup of liquid total. -Slightly beat your egg white until just frothy, and mix in with your wet ingredients. -Add your wet mixture into the oat mixture, and stir until evenly coated. -Spread on a 12×17 baking sheet. If you don’t have this size, you can make it in a regular 9×13 cake pan, it just might take a little longer to bake. Basically, you just need a large pan with edges. -Bake at 275 degrees for one hour and 15 minutes, stirring the mixture 3 to 4 times during the baking. 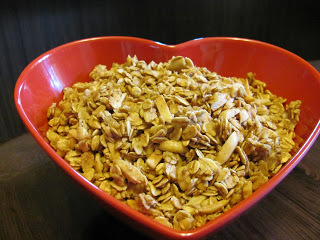 -The granola won’t get crunchy until it’s completely cooled, so don’t over bake.